Image kindly supplied by the Swindon Advertiser. You can download the full article by clicking on the image above or an electronic version of the article can be seen below. This was published in today’s Advertiser. IF Hitler had pulled off a successful invasion of Britain – a scenario often speculated about by alternate history buffs – Coleshill might well have been spoken of these days as a former terrorist training camp. Coleshill, the Nazi history books would say, was where British enemies of the Reich learned their murderous trade. Now that I think about it, though, this site in the tranquil Wiltshire-Oxfordshire border country probably wouldn’t be spoken of at all these days. The Nazis would almost certainly have erased this seat of British resistance from the landscape and from history as soon as possible. 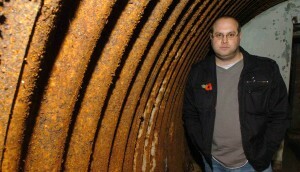 By 2009 in this hellish alternate Britain, the Reich’s slick spin doctors would greet press inquiries about Coleshill’s role in World War Two by raising their eyebrows quizzically, chuckling something about urban legends – and then arranging for the journalist in question to undergo a little “retraining” in a soundproofed basement somewhere. The old Coleshill estate, you see, was where Churchill ordered that a secret army be trained in guerrilla warfare tactics to be used if the Nazis managed to land and advance in Britain. This nationwide army was called the Auxiliary Unit. Based in small groups in underground bunkers, its job would be to terrorise, demoralise, sabotage and inconvenience an occupying enemy. With Remembrance Day just gone and British troops still sacrificing their lives overseas, it’s impossible to think of this place and its work without being moved. A leading expert on wartime events at Coleshill is Tom Sykes, a freelance marketing manager from Highworth who has his own company, Goldeneye Creative. He has put together an extensive website – www.coleshillhouse.com – with first hand accounts, official information, video footage, photographs, drawings and a growing community of interested people. He agreed to talk to me about the history of the place and show me some of the few remaining traces of that history. The aim was to disrupt the occupying forces until reinforcements from British and Empire personnel overseas could be brought back to join the fight. Once activated, perhaps by a pre-arranged signal rung on church bells, resistance groups the length and breadth of the country, all of them trained at Coleshill, would do all they could to wreck the invasion until their food, their luck or both ran out. And then? Death in battle or at the hands of the Gestapo was all but certain. Between 1940 and 1944, when the Allied offensive in mainland Europe reduced the threat of Britain being invaded to nil, some 5,000 people were trained in the grounds of Coleshill House, a mansion near Highworth. The house was demolished in 1952 following a fire, and a hedge and garden now mark its footprint. The saboteurs were ordered to keep their doomsday status from friends and loved ones, and many carried their secret to the grave. Training included work with explosives, surveillance, sabotage, moving silently, living silently and killing silently. Volunteers would be asked to report to Highworth Post Office. Postmistress Mabel Stranks, who has a road in Highworth named after her in tribute to her role, would alert Coleshill by telephone. The volunteers would be picked up in an army truck and driven to the training ground. Apart from the hedge marking the footprint of the house, little remains of the sights the volunteers would have known. Remaining traces include a blocky, deserted building on the approach road to the estate from Highworth, which Tom strongly believes was a gatehouse. The buildings surrounding the old stable yard, used during the war as billets and training facilities, are owned, like the rest of the estate, by the National Trust, and are rented to tenants. (This is why Tom requests that people with an interest in Coleshill’s secret history check out his website rather than traipsing around the area themselves.) The most atmospheric relic by far, though, is an old underground training bunker that lies beneath woodland in a location Tom asked me not to reveal. A claustrophobic concrete and corrugated iron semi-cylinder about the size of a large van, it was used to demonstrate to volunteers how to build and use such bunkers in their own areas. There would once have been six fold-down bunk beds, a stash of weapons and a meagre stove whose chimney came out above ground and was hidden by a fake tree. The entrance shaft is screened by a zig zag of stout brick walls. And there, beneath the ground in Swindon, Southampton, Carlisle, Chester or wherever, that soldier and his comrades would have been met by the Auxiliary Unit, ordinary people ready to fight to the death and trained at Coleshill. Similar type structure found at Devizes by John Girvan, excavated in 2009. Telegraph sets found inside. Could you please email us and tell us more?